The Mayas believed in more than one god. The most important god was "the Great Goddess" who controlled nature, lakes, fertility, rivers and caves. Her hands were shown distributing water, seeds or jade. 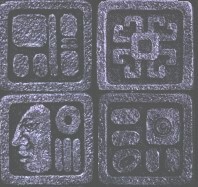 Mayas thought gods such as the war or sun god could enter physical objects. Higher gods like the sun god and moon goddess didn't interact with humans. The Mayas built temples that were as big as 500 feet across and high. 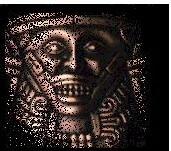 When the Spaniards came the Maya priests were driven underground or killed. The people of Teotihuaca`n believed they lived were time and Earth began. They believed that their ceremonies kept them prosperous. The gods were all related to daily life (ex. The rain god made it rain.). The people believed the rain god was the son of the sun god. All Maya lives were tied to rituals for the gods. Mayas continue to believe each soul has a spirit companion. Religion was all-important. They worshipped a sun, rain and almost any other thing there could be a god for. They also believed in an after life. People thought that caves were entrances and exits to the under world. In their religion they sacrificed animals or humans for things like rain or food. Many important gods and goddess were the sun, rain, war and The great Goddess.